Are you joining in on Bonnie Hunter's new mystery? 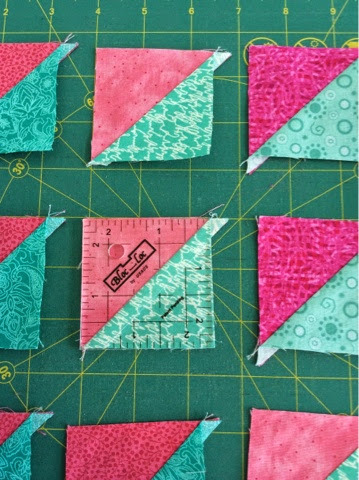 I love a mystery, and I look forward each year to Bonnie's new project at Quiltville.com! Using my Bloc_Loc ruler to check if my HSTs are truly 2.5" -- they are! UPDATE: Granny Maud's Girl asked about the Bloc_Loc rulers. They are my absolute, all-time, total favorite for making perfect HSTs (and even more for Flying Geese!) Here is the link to my post describing how to use the Bloc_Loc HST ruler. Becky asked what method I used for the rectangles. I used the flip-and-sew method. One of the ladies at Ruth's "Bonnie Hunter Mystery Sew-Along" used the EZ Angle method with good results. I swore to myself that I would save the cut-offs, but I caved and tossed them in the "cat bed donation scraps" bin! Here are some bits for part two. Love that bright pink! I'll have a new finish to share on Friday! Which method did you use for the rectangles? I've never used templates for piecing so I think I would opt for the stich and flip method if I was doing the mystery this year. Loving the bright colours, should look amazing! Are those BlocLoc rulers as helpful as they look? One day I plan to treat myself. Yay for a new finish later in the week. :) Love your Mystery fabrics. Hey, Marti - what is the BH Sew Along that Ruth's is doing? I did Celtic Solstice and loved it, but haven't decided if I am doing this one. Yes, I'm in. I have done Carolina Christmas and Celtic Solstice - but they're not quilted yet - only made half. I love the colors of this one. I used method 2 in part 2 - couldn't get my printer to print the templates the right side. I am doing it too; but got way-layed by a bad cold. I have my HST all done from clue 1. I love my June Tailor "Perfect Half Square - Quarter Square triangle ruler" for marking and squaring up. I have clue 2 all cut and marked for flip and sew. 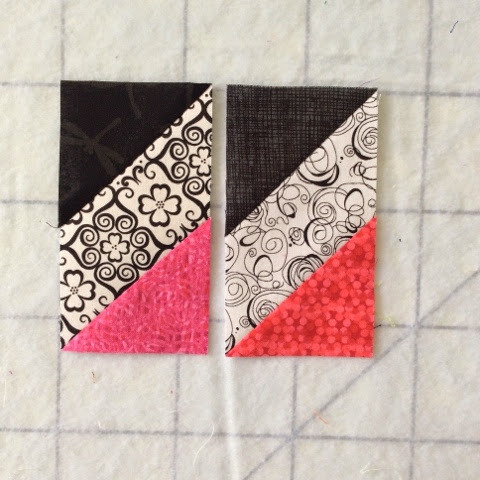 I use the JT Shape Cut for strips and sub-cuts into rectangles and squares. While I was suffering with the cold I sat and marked all my pieces. So; nearly 2 weeks behind, but hoping to restart in the next day or so and get caught up!